Before I started working on the wishing dress I never realized just how much I love bustle dresses from the 1870's and 80's. They're shape is just so different from any other era and they're so pretty! Now that I have the proper underpinnings for a dress from this era I've been thinking that after I make the wishing gown I will make another bustle dress, but more historically accurate. Here's a little history on the rise and fall of the bustle. 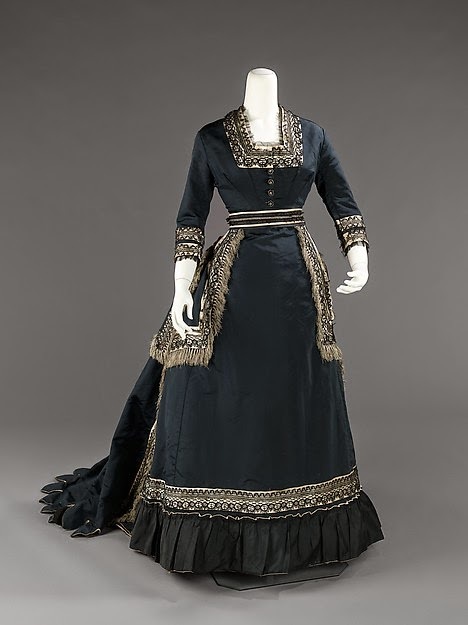 The bustle started to appear in woman's fashion in the last few years of the 1860's. The bustle continued to grow larger while the skirts grew smaller and the cage crinolines went out of style. 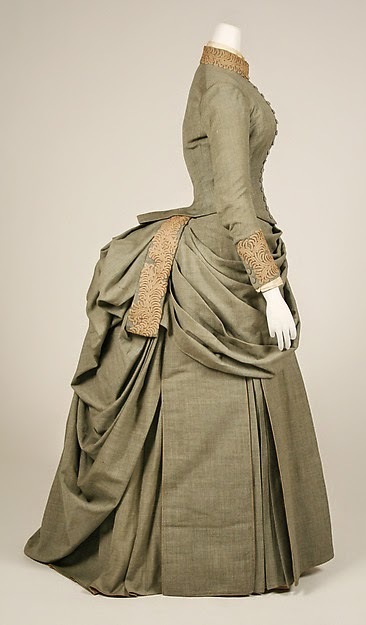 In the early part of the 1870's the skirts were still quite large, flat in the front but still fairly full in the sides. But as time went on they started to get smaller while the back increased in size. Originally the bustles were high up, but as the years went by it lowered until it finally disappeared in the middle of the decade. 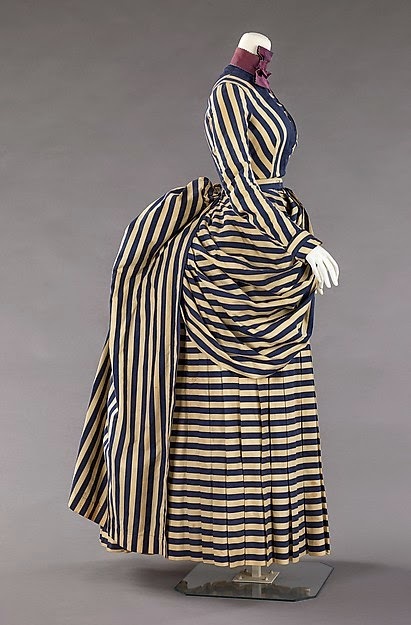 For the next several years it was fashionable to have a very slim figure, known as the natural form, which had a long straight bodice and the back was also long and straight. The bustle returned in the 1880's. The skirts were much smaller and not as full on the sides, but the bustle had returned. They grew larger as the years went by and were quite large in the late 1880's before the bustle went out of fashion again by the early 1890's. 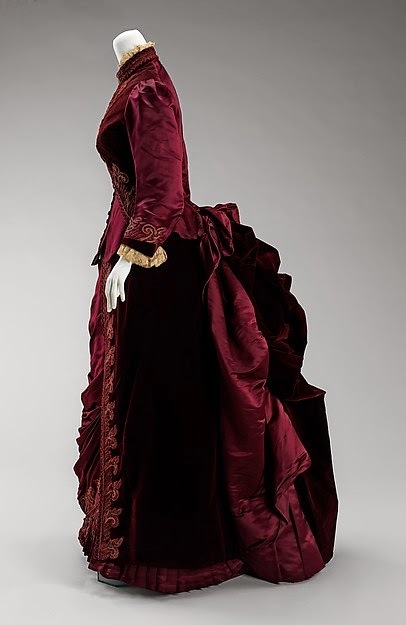 Here's some gorgeous bustle dress inspiration ranging from the early 1870's to the 1880's. 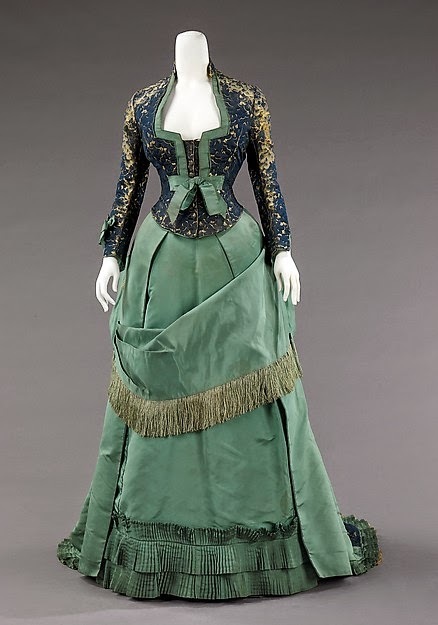 1887 Wedding Ensemble. Made of Wool.